Owners can't give their dogs pesky and unpleasant colds, but that doesn't mean that illnesses are never transmissible between people and animals. If you have a pet ferret and he's displaying, worryingly enough, all of the classic signs of scabies, you and the rest of your household could get infected too. Scabies, frequently called "sarcoptic mange," is a parasitic infection that appears in ferrets occasionally. The skin condition is caused by Sarcoptes scabiei, a teeny mite. If your ferret is scratching up a storm, there's a good chance he's playing host to these mites. Scabies presents in one of two ways: centered around the feet ("foot rot"), or involving the skin in its entirety. The two types are both hazardous, and both call for urgent veterinary evaluation. Be attentive to any symptoms of scabies in your ferret, as they go far beyond extreme scratching behaviors. Typical symptoms of the parasitic disease include rash, sores with discharge, missing clumps of hair, swelling and redness of the feet. If you observe even one of these things in your ferret, take him to the veterinarian for assessment and management immediately. Besides causing your ferret serious discomfort, untreated scabies can lead to bigger problems: all that scratching can cause open sores and infection, and foot rot can damage your pet's feet permanently. Human beings can indeed contract scabies from ferrets, reports veterinarian Sharon Vanderlip. 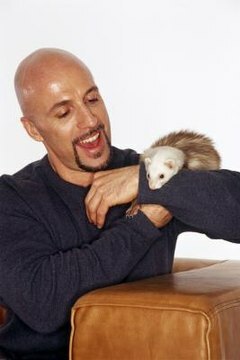 People can get scabies either from touching something the ferret regularly touches, or from touching the animal himself. Not only can ferrets handily give the infestation to people, they can also give it to fellow pets. Because of this, it is crucial to also seek out veterinary attention for any other pets that have been in the company of your infected ferret. It is also crucial to keep ferrets with scabies in different rooms from pets without the condition. Thorough living space sterilization is a must for ferrets on the path to getting scabies out of their lives. Diseases that can be passed from an animal to a human are known as "zoonotic," and ferrets can carry several, including ringworm, giardia and salmonella, according to the public health division of King County in Washington State. Because of the risk of ever getting anything from your ferret, it is vital to be diligent when it comes to hand-washing after touching your pet. If you experience itching and suspect that you contracted scabies from your ferret, talk to your doctor as soon as possible. Manual of Exotic Pet Practice; Mark A. Mitchell and Thomas N. Tully, Jr.
How Do Dogs & Puppies Get Parvo Even if They Don't Leave Their Yard? What Causes a Parrot to Chew Its Foot?